I love coffee. There's nothing better than a hot cup of coffee in the morning to help you start your day off right. However, as we seem to be experiencing the last little bit of hot weather of the year, sometimes a hot coffee is not what I want. I've always wanted to recreate the gorgeous iced coffees that are available various different coffee shops in the summer. 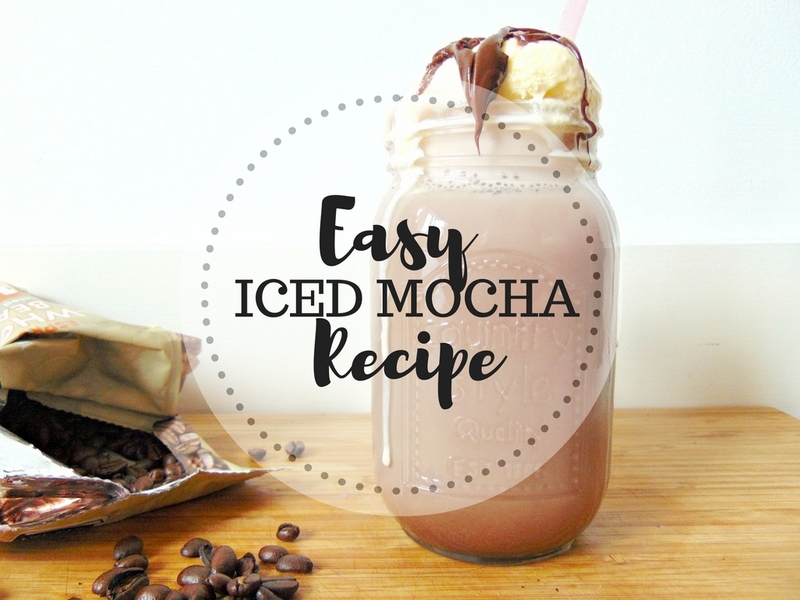 I opted to make an iced mocha and I couldn't believe how quick and easy it is to make. Here's my Easy Iced Mocha Recipe. When I had the chance to collaborate with Savisto, I knew that I'd love to try their Coffee Grinder. Everyone in our house is a huge coffee lover, we have coffee gadgets and different types of coffee for whatever we feel like that day, but the one thing we missed was the chance to grind fresh coffee in the mornings. The Savisto Coffee Grinder is so simple to use. All you need to do is scoop a few coffee beans into the grinder and off you go! The steel blades quickly chop up the coffee beans (or nuts and spices) until they're fine. The clear lid also allows you to keep an eye on the consistency and stop it when it reaches the consistency you like. The coffee grinder also has a large capacity chamber, perfect for those who have a whole heap of coffee lovers waiting for their morning coffee or alternately, chopping up spices for an evening meal. We just make a small batch in the morning to keep us going for the remaining of the day, but there is an option to make it in bulk if you like! I am so impressed with this little machine. It's small and sits perfectly in the corner of our kitchen, but it definitely has some power behind it. You can't beat the taste and smell of fresh coffee and the Savisto Coffee Grinder has made our morning coffee even better! So first things first, I grind the coffee until it is a fine consistency. I brew a small cup of coffee and wait until it's cold. I like my coffee quite strong, but obviously, you can pick how strong you want it. Mix the hot chocolate, half a mug of milk and cold coffee in a blender. Once mixed, pour into a glass and add ice cubes (you can also use coffee ice cubes for this). Add a scoop of ice-cream (or as many as you want!) Alternatively, you can use whipped cream. This honestly tastes as good as the iced drinks you can buy in coffee shops. Even better yet, you're in charge of the chocolately goodness and extra ice cream. I never knew how much I needed the Savisto Coffee Grinder in my life until now. It's quick and easy to use and the smell of fresh coffee in the morning is delightful. Are you a coffee person? Would you make this recipe at home? If you liked this post on Samantha Jayne, you might also like The Pen & Pencil Food Review and The Sugar Junction Food Review.